The recipe can be used as an dessert at mealtimes or a snack. As simple and unimpressive as it sounds, it isn't. This is a really good dessert and appertizer. The combination of the swee tand the salty is really great and if left rovernight in the refrigerator, the taste is enhanced, as the salt spreads out on the honey. Yum! Original recipe: Dulcia domestica: palmulas uel dactylos excepto semine, nuce uel nucleis uel pipere trito infercies. sale foris contingis, frigis in melle cocto, et inferes. Translation: Take palms or dates with the stones removed, and stuff them with nuts or nut kernels and ground peper. Salt the dates on top and bottom and fry in cooked honey and serve. Roll almonds in cinnamon and stuff one in each date. Place dates on a greased pan. 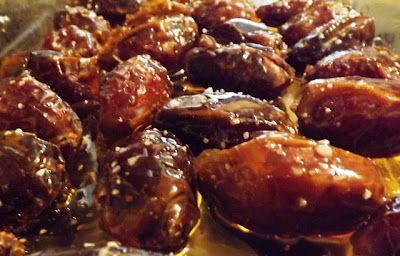 Sprinkle salt over the dates, then coat each one with honey. Glaze in a very hot oven (450°) for 10 minutes, then serve.